Image Size: 48"w x 42"h.
When we first published "Warmed by the View," the most popular question from collectors was "Who would build a campfire that close to a cliff?" Artist Stephen Lyman answered this question quite simply, "I did." An avid adventurer, Lyman lived his paintings and "Warmed by the View" is no exception. Never one to pick level, comfortable camp sites, Lyman preferred more dramatic, unique locations where he could enjoy 360 degrees of landscape view. It's difficult to name one signature piece with artists as talented and prolific as Lyman. Certainly his series of campfire paintings qualify, and "Warmed by the View" is one of the crowning jewels in that series. This cliff edge above Yosemite Falls is a typical camping spot for Lyman. "Fortunately," he would say, "it's hard to go sleepwalking when zipped in a sleeping bag." “He paints the wilderness with a knowledge and genuineness that can only be expressed by someone who has ‘been there’.” – Bev Doolittle Through Lyman’s art, you can travel into a wilderness very few have experienced. You can share the sensation of being in the true outdoors – exploring, discovering, studying and enjoying the all-encompassing beauty of unspoiled nature. 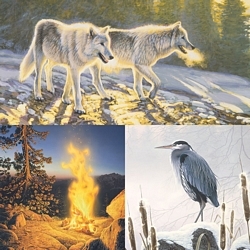 Stephen Lyman was an explorer who specialized in painting the most elusive moments in nature. His inspiring work was inspired, in turn, by the writing and teachings of famous naturalist John Muir. “Muir wrote, ‘Climb the mountains and get their good tidings,’” Lyman said. “I know exactly what he meant.” Lyman’s love of the great outdoors stemmed from a childhood spent in the Pacific Northwest, where hiking in Snake River country was a regular family ritual. Lyman’s desire to share his admiration for the outdoors was strong, but he enrolled in the Art Center School of Design in Pasadena, California, to learn more about the commercial art field. He started his career as a commercial illustrator in Los Angeles and soon realized that the call of the wild was stronger than the lure of the city. Returning to Idaho, he spent two years exploring and developing his own style of painting. He continued to discover the wonders of the natural world and of living a natural lifestyle. “All my paintings have their origins in my experience and perception of beauty in the wilderness,” he said. Lyman’s first limited edition print was published by The Greenwich Workshop in 1983. In subsequent years, he was a frequent participant in the prestigious international “Birds in Art” show at the Leigh Yawkey Woodson Art Museum. He was invited to be “Artist of the Year” at the 1991 Pacific Rim Wildlife Art Show and then received the rare honor of being invited back as an “Encore Artist” at the 1995 event. Stephen Lyman actively shared the wonder of the natural world with a legion of collectors until his untimely death in 1996. He had been recently named one of the top artists in the country by U.S. Art magazine and his book, Into the Wilderness: An Artist’s Journey, was published to unanimous acclaim in the autumn of 1995.